So you have your ideas, you’ve written multiple posts, and you’ve scheduled publication for them. Good job, but there’s still a little more to do. To keep everything in order and easily accessible, we’re going to create a publication spreadsheet. I know there are a lot of organizational tools out there, but when it comes to blogs, I create a spreadsheet to keep track of everything. Take a look at the photo below. A good blog spreadsheet will keep you organized, and keep your blog on track. The column headers are pretty self-explanatory. In the “Title” column I list the idea, though I may not actually use the title listed as the final published title. The “Date” column is where I list the intended publication date, while I list the targeted keyword in the “Keyword” column. If there’s a research link or idea link I’ve found, I’ll include that in the “Research” column. That’s the basic spreadsheet. (Note, I’ve used the LibreOffice version of Excel. It’s a free, open-source version of Microsoft Office.) For some clients I use a different version, depending on the needs of the blog. 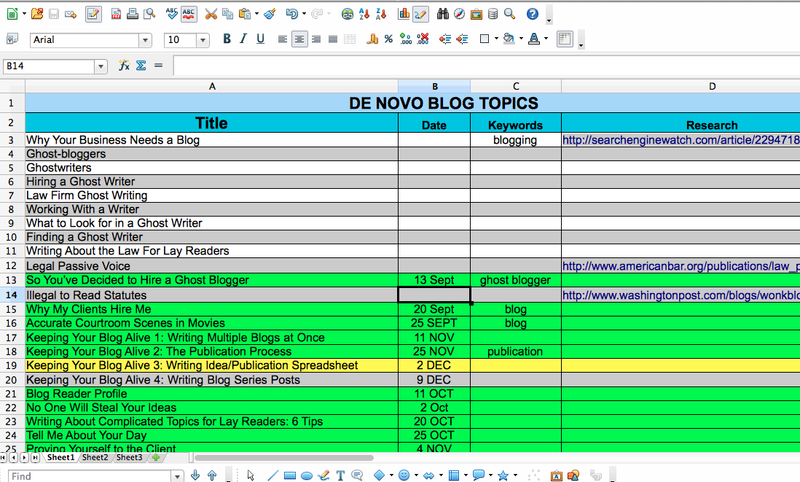 For example, if I’m writing multiple blogs a week, I’ll usually have the “Date” Column on the far left. Each row will be the week, while I’ll use 2 or more columns for the 1st, 2nd, or 3rd blog idea that I have to write that week. Also, I use color to convey information. Green rows represent completed, edited, and published posts. Yellow rows represent written, or written and edited, but not published posts. As you get into the habit of writing blog posts you’re going to start thinking of new things you want to write about. You won’t have the time to write about them immediately. Some may require research. Some might require interviews. Some might take more time to write than you have at the moment. Whatever the reason is that’s stopping you from writing your post now, you absolutely must write the idea down. Ideas will keep your post prospects alive, and an idea list is essential. If you look at the spreadsheet photo I included above, you’ll notice that I have several ideas that are not highlighted in green or yellow. That’s because I haven’t written them yet. Some of them I might not ever write about. Others are ideas that I can use to write one or more posts. Yet regardless of the quality of the idea, I write it down when I get it. Then, when I schedule my regular writing session, I know I have somewhere to go. I know that I don’t have to sit down, research ideas, then write the posts. All I have to do is go to the spreadsheet, look at what’s available, and get to work. Having all the ideas in one place eliminates a lot of the stress of sitting down at a blank piece of paper. You already have somewhere to start, and you don’t have to struggle to find something to write about. So, with the publication spreadsheet in place, next week I’ll look at how you can use your idea list to feed yourself a steady stream of stuff to write about.